Paris is symbolized by the Eiffel Tower, San Francisco by the Golden Gate Bridge, and New York City by the Statue of Liberty. Portland, Oregon’s icon is Portlandia. What is Portlandia, you say? In the 1980’s during construction of the Portland Building – a 15-story post-modern box designed by Michael Graves – a call for artists went out under the auspices of the Percent-for-Art ordinance. This program requires a percentage of the budget for any publically-funded Portland construction project be used to commission public art. Sculptor Raymond Kaskey got the nod to create a statue, using the seal of the City of Portland for his inspiration. His creation “Portlandia” is a robe-clad female figure on one bended knee, a trident clasped in her left hand, while her right hand reaches down to the denizens of the city. At about 35 feet tall (10.6 meters) she is the second largest hammered copper statue in the United States, second only to Lady Liberty. While Miss Liberty enjoys world-wide fame, Portlandia remains in obscurity primarily due to a stipulation in Kaskey’s contract that he retains all rights to her image. You won’t find any postcards bearing her likeness, let alone any tourist souvenirs. Portlandia is a beauty though, glowing with a dark bronze-like finish thanks to another requirement by Kaskey. Her caretakers must give her a periodic coat of wax which keeps the copper from oxidizing, and any bird who tries to land on her slides right off. Portlandia has resided at the Portland Building since her October 1985 dedication. 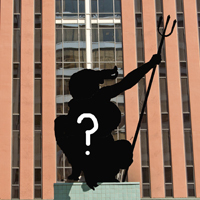 Seek out this reclusive lady at 1120 SW 5th Avenue, perched on a third-floor pedestal above the building’s west entrance. The best view is from across the street, near the plaque containing a poem written especially for her by Portland resident Ronald Talney.